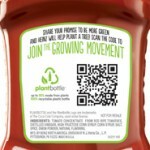 “Join the Growing Movement” campaign has been launched on restaurant bottles of Heinz Ketchup featuring PlantBottle technology, which invites consumers to promise to be more environmentally responsible through a mobile application. For each pledge made, Heinz promises to plan a tree, up to 57,000 trees. PlantBottle plastic looks exactly like regular ketchup bottles, but it is actually 100% recyclable and made out of renewable material derived from sugar cane. All 20-ounze ketchup bottles are made with PlantBottle packaging. Participating in the “Join the Growing Movement” is easy and helps plant a tree! 1. Scan- Find a “Join the Growing Movement” Heinz Ketchup bottle at several local restaurants and use a smart phone to scan the QR code. This will then bring up the mobile application. 2. Pledge- Promise to live a greener lifestyle by choosing an activity. 3. Share- Tell your friends on Facebook or Twitter how you pledged to be green and in return Heinz will plant a tree.